Rick Hartman has been fly fishing for redfish on the lower Laguna Madre for over 23 years and guiding full-time for the last 10 years. Rick is an incredible fly caster and puts his skills to good use since he specializes in sight casting for redfish, speckled trout and snook in the flats of southeast Texas. Rick puts in 175 to 210 days every year guiding anglers to trophy redfish in southeast Texas and prides himself in knowing these waters like the back of his hand. The fishery he works is good year-round for redfish, trout, and snook. Rick Hartman a professional guide on the Texas coast who specializes in redfish. Listen in to Rick's secrets on hooking up with the big ones. There are seasonal opportunities for tarpon and other offshore species as well. Rick covers the 50+ miles of the Lower Laguna Madre, from the land cut north of Port Mansfield, to South Bay and the Brownsville Ship Channel near the resort community. Rick Hartman has been part of several television shows including the Scott Martin Challenge which features Scott Martin using traditional lure bass fishing and Rick Hartman fly fishing for bass in head to head completion in 2008. He was also featured in Fly Fishing the World, a multi-network televised show staring football legend Merlin Olsen, fishing the Lower Laguna Madre in 2004. He is currently sponsored by New Water boats, Sage, Oakley, Under Armour and Hatch Reels. 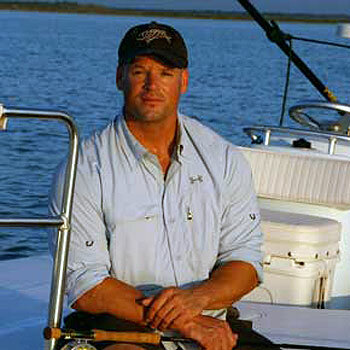 To find out more about Rick Hartman and the guide services he offers visit his website at www.RickHartmanFishing.com.